Refresh sweaty skin with this portable facial cleaning sheet. Removes oiliness and dirt, also helps prevent acne. Freshly scented cleansing sheets leave a thin clear powder that controls shine for hours. For men and women. Salicylic acid softens old keratoid layer, powder prevents excess sebum secretion and oiliness. So convenient - perfect for gym, travel, outdoor sports, office when washing with water is not possible. Imported from Japan, comes with English ingredients and usage instructions. 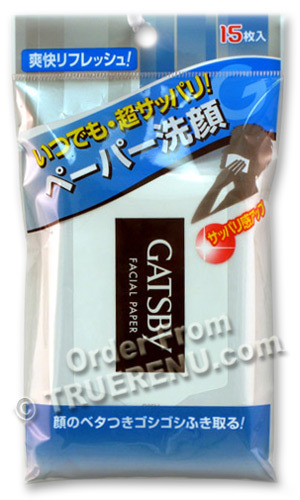 Extra large, 100% natural cotton mesh sheet (20cm x 20cm) - perfect for wiping entire face with just one sheet. Paraben Free. Ladies and Gentlemen, this is another one of those brilliant little ideas that Japan has sent our way. They not only remove sebaceous perspiration and grime, but they leave an invisible powder that continues to absorb oil and control shine for hours afterwards. Use them on your face or body when you can't wash, to feel refreshed and to smell clean. Great anytime - just a simple quick wipe and your good to go! Remove a moist cleansing sheet, wipe and discard. Also available are Mandom Simplity Body Deodorant Wipes in Savon (item 7029) and Grapefruit (item 7030) scents. Avoid contact with eyes, as the sheets contain alcohol. Not for infants or children. Ingredients: Water, alcohol, talc, sodium citrate, PPG-6-decyltetradeceth-20, menthol, citric acid, fragrance, salicylic acid. Product Size: Portable soft package contains 15 cooling, refreshing powdered disposable extra large mesh sheets: 20cm x 20cm (about 7.87 inches square). Page displayed in: 0.1880 seconds.